Here is my latest creation. I bought a "new to me" Tim Holtz die from a garage sale and wanted to use it asap. Here you can see how I used it. The die is Courtyard and the frame surrounding the "lattice" is from Stampin up called deco labels, the same die I had used in a previous card. Love this die set. I also scored the lines to frame the deco label using my scoreboard. The rose was made using the Mcgill punch called floral petals and the leaves came from another new die that I had purchased awhile back called Garden greens another Tim Holtz die. The tiny flowers were a combination punched from a Stampin up punch and an ek success punch. 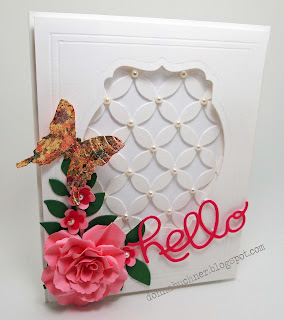 Finally the "hello" sentiment is a die from Stampin up . Oh and on the butterfly I used variegated flakes! something I had purchased a long time ago and finally decided I should try it! I will definately use it again.